Although, more often than not, the sun shines brightly in an azure sky above the small French town of Rennes-Le-Chateau, it is a place wrapped in mystery like few other places on Earth. Conspiracy theories cling to it like an invisible mist. The roots of the mystery, at least as it came to public light, lie in the actions of a young French parish priest in the late 19th century. Saunière ordered the renovation of the church and many other associated buildings. He spent a great deal of money on this. But how could he afford it? He lived only on the modest stipend allotted to him by the church. This simple question, seemingly mundane as it is, has been the pier from which a thousand conspiracy theories have set sail. One unremarkable answer suggests itself : he sold masses. Then it was the custom in France for priests to charge a small amount for the holding of masses. The faithful would ask for a mass to be held for some specific purpose, an ailing relative perhaps, and would pay the necessary fee. But masses take time to perform and there are practical limits on how many could reasonably be performed in a single day. Given the fees that were charged, there was no way that Saunière could have performed enough masses to cover the costs of the renovations he ordered. Is it possible he was charging for masses but not performing them? The authorities thought so. Saunière was accused by the church of misconduct and dismissed from his post. But might his wealth have had another source? From the 1950s on, books began to be published suggesting that something much deeper than a peculating priest lay behind the odd series of events in Rennes-le-Chateau. The claim was that Saunière had stumbled on an ancient secret : that the church at Rennes-le-Chateau was the seat of an ancient monastic order, the Priory of Sion, whose purpose was to preserve an ancient bloodline, that of the Merovingian kinds of France. In later accounts this bloodline was extended even further backwards and alleged to be originally that of Jesus himself, who supposedly had married and fathered children with Mary Magdalene. Some even believed that Jesus had not died on the cross at all, but had emigrated to Languedoc with Mary Magdalene where he lived, died and was buried. For centuries, the Languedoc region had been associated with bizarre religious movements. The druids had flourished there. 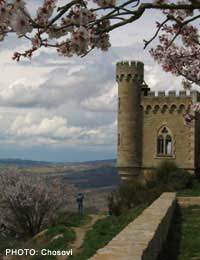 Later the Cathars, a heretical sect of Christianity, had made its base there. The Vatican set up an inquisition in the region to root out the heresy and even launched a crusade against the Cathars. In the mountain fortress of Montségur, the Cathars made their last stand. Besieged by Crusader armies, they held out for almost a year before finally capitulating. In the aftermath, two hundred Cathars were burned alive following their refusal to renounce their faith. Rumours circulated that shortly before the siege came to an end, however, several men had escaped from the fortress. Had they carried something with them? Many believe that Saunière’s wealth came from treasure he had found in his church vaults. But where did it come from? Some say the Cathars; others the Knights Templar; still others the Priory of Sion itself. An alternative theory is that Saunière discovered ancient parchments which had been stored secretly somewhere within his church. These parchments, containing revelations about Jesus, were considered so potentially explosive that Saunière was able to use them to blackmail the Vatican. Fearful that the truth about Jesus, if known, would undermine the entire basis of the Christian faith, the Vatican had allegedly been engaged in a secret war against the Priory of Sion for hundreds of years. The power of the Catholic church had forced the order underground to conspire in secret, waiting for the right moment to arrive. Over the course of its history, a number of famous names were said to have served as grand masters of the order, including Leonardo da Vinci, the scientists Robert Boyle and Isaac Newton, the painter Nicolas Poussin, the writer Victor Hugo, and the composer Débussy. Some of the documents that some of these claims were based on were later shown indubitably to have been forged. The chief conspirator behind the forgeries was revealed to have been Pierre Plantard, an obscure con-man who wanted to have himself recognised as the legitimate heir to the French throne. Despite the revelations of forgery, the mystery mongers have not given up. Some even claim that the forgeries were planted deliberately to throw investigators off the scent, preserving the real mystery which remains intact. Although it had been known to occultists and mystery seekers for many years, Rennes-le-Chateau only achieved major celebrity recently thanks to Dan Brown’s Da Vinci Code novels. Brown did not mention the town by name but the core concept of his series – that Jesus and Mary Magdalene had children together and that their bloodline continues to this day – was intimately associated with Rennes-le-Chateau. As a result, it now enjoys a flourishing tourist traffic and will no doubt continue to pique the public imagination for many years to come.